A Boston-based developer hopes to build a 93,000 square-foot mixed-use building with 80 apartments along the Massachusetts Turnpike in Allston. The proposal for 61-83 Braintree St. also calls for 6,000 square feet of retail space and 68 parking spaces in Allston, according to the Boston Redevelopment Authority website." Anyone else curious why Harvard ripped out these perfectly nice looking trees on Everett Street behind Petco? And replaced them with these new trees and planters? There's nothing wrong with the new landscaping, but it seems like an unusual priority considering the previous condition of the area which seemed just fine. One of Harvard's 6 proposed public realm community benefit projects is new streetscape along Holton Street across from the Star Market loading dock. The green line in Harvard's map shows this streetscape improvement continuing along the backyard of the two-family home that Harvard owns at 208 Everett Street at the intersection of Holton and Everett. But isn't this a strange place for a streetscape improvement? Harvard recently installed this white fence and the opportunities to make this stretch of Everett Street lovely seem limited at best. I recently posted this photo from 96 Holton Street (across from the Star Market loading dock) where Harvard proposes to make one of its 6 public realm community benefits. I wondered why the fine-looking plants that used to be here were removed. So I was surprised when I just went by the same site. It looks like it was all replanted yesterday. It is a peculiar definition of community benefits to include landscaping on Harvard property to improve the appearance of its own commercial properties. And it is strange to start implementing these benefits so immediately after proposing them without waiting for any feedback on the proposal. I always thought those plantings were just fine. Maybe there was space to add a couple more hosta, but I certainly don't think there was anything wrong with it. Well, someone at Harvard must have had a problem with how that looked. All those plants have been torn out and it seems to have happened very recently. Now Harvard is proposing to plant new plants to replace the ones that were removed. And Harvard thinks this should be one of our 6 public realm benefits during the next 10 years. 100 Holton Street is across the street from the Star Market loading dock, next to the blank brick wall of an old Harvard building where I think the Fire Department still trains, and next to another Harvard property. It is also the site of one of Harvard's 6 public realm offerings. How nice will the entrance to this parking lot be when Harvard is done with it? Certainly I think the entrance to every Harvard parking lot should be lovely, but if you were choosing 6 ways to improve our community would this be one of them? What happened to Rob Lue's big (and not so big) ideas? "HarvardX is one of those Harvard efforts which I think could be used to strengthen and expand the Ed Portal’s work. HarvardX is an effort to bring educational content to the internet"
"I think HarvardX has a place in the Ed Portal. Bringing HarvardX to the Portal would allow for us 6 to train people to use a computer and to plug people into knowledge and the information super highway." "I want to look into establishing a tablet loaner program." After all of the enthusiasm from Rob and other Harvard staff, it was strange to watch Harvard's community benefits proposal presentation last week and see nothing about about Prof. Lue's ideas. In Chicago, the Smart Community program has training courses that "offer participants a notebook computer once they’ve completed a designated set of classes—in total nearly 1,300 computers will be distributed." Compared to that, Prof. Lue's suggestion that maybe Harvard could create a loaner program to let people borrow a $200 tablet computer doesn't sound all that generous. But according to the presentation given last week, Harvard won't even be creating that iPad library. Another one of Harvard's 6 proposed public realm projects seems intended to help connect North Allston / North Brighton and the Charles River. That's great! You call that a "top 6 community benefit"? I'm a huge fan of making our streets safer and I spend plenty of time with young children walking and bicycling around North Allston. But it never occurred to me that the intersection of Holton Street and Everett Street was one of our biggest safety issues. The intersection already has traffic lights, push buttons for walk signals, and the electronic countdown timers that tell you how long you have to cross the street. But somehow replacing this traffic signal is one of the six things that Harvard wants to do in Allston. Harvard's IMP has this map on page 183 showing "Planned Transportation Improvements". As someone who lives near Lincoln Street, bicycles frequently, and remembers when a cyclist was killed at the intersection of Lincoln & Franklin, I was very pleased to see these "BTD Bike Plan Elements" that I have highlighted in this image from Harvard's IMP. Too bad Harvard's map is not true. BTD has no plans to improve these roads. I asked the BRA and Boston Transportation Department what these "BTD Bike Plan Elements" were for Lincoln Street and Litchfield Street. I got a copy of the City's 5 year and 30 year bike plans as shown below. Neither one shows BTD doing anything on Lincoln Street or Litchfield Street like Harvard says. It is also too bad that Everett Street is in the 30-year plan but not the 5-year plan. Did you know there is an Ed Portal Plaza? While it is nothing like the beautiful Javits Federal Building Plaza that I mentioned in a recent post, Harvard's Ed Portal has its own plaza on North Harvard Street. The Science Complex Cooperation Agreement describes these "new pathways and landscaped entrances" to the Ed Portal as part of $1.8 million dollars in community benefits that Harvard would invest in Barry's Corner. Portal including landscaping and streetscape improvements." I mention all this because it is an example of how nice-sounding community benefits sometimes don't work out all that well. There was no public process to design this "plaza", and I don't think the result is all that great. Has anyone ever said "Let's go hang out at the Ed Portal plaza this afternoon?". 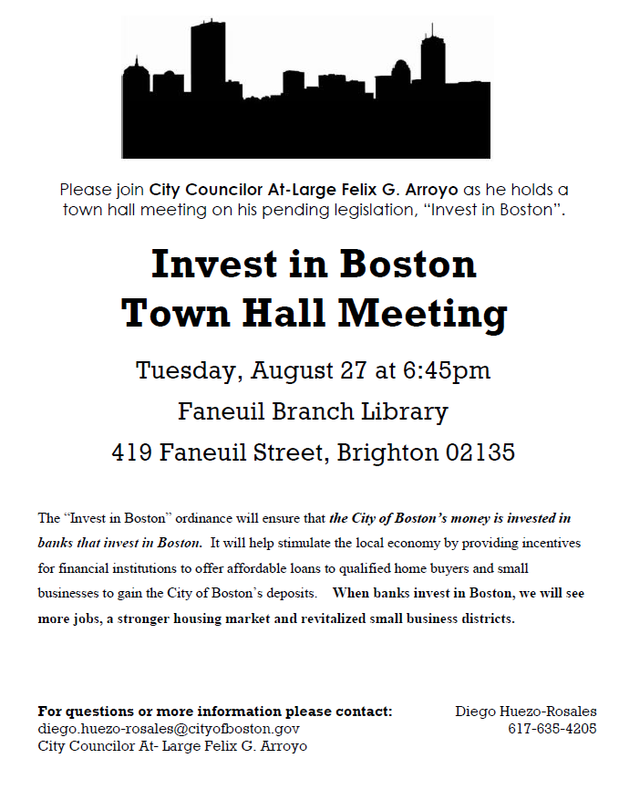 And while most plazas are built to last decades, this "community benefit" will be demolished just 5 years after it was created to make way for the construction of the new Barry's Corner Apartments. With all the recent talk about creating great new public spaces in Allston, I thought this could be an interesting example to keep in mind. It was designed by the same firm that did Ray Mellone Park behind the Honan Library. This 1 acre park cost $18 million and is featured in the current issue of Architectural Record magazine. The article notes that "Public plazas are difficult to design and program—in-between spaces that are neither park nor street." "The plaza is inviting, in part, because of its obvious craft. From the benches, for which the marble was handpicked from a Vermont quarry, to the bronze garbage cans, which appear to balance on their rounded bottoms from sheer centrifugal force, the luxury of the hard surfaces complements the garden elements." The architects created curving plant beds to provide visitors with a sense of intimacy and separation from the street. 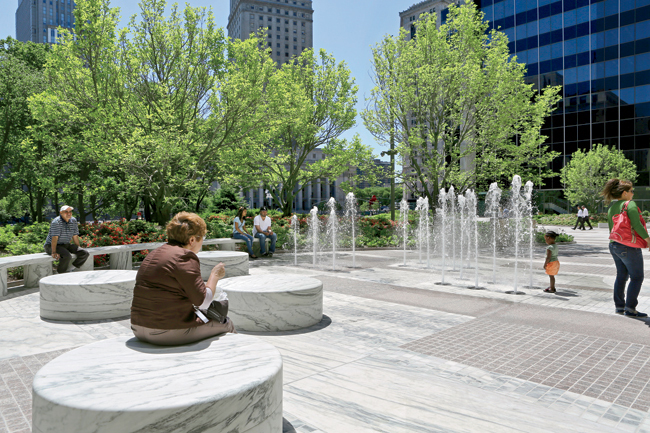 The marble benches and cobbles add luxury to the civic plaza. Magnolias in bloom signal spring’s arrival. Today, curved plant beds hug marble benches, some with embedded LED lights. 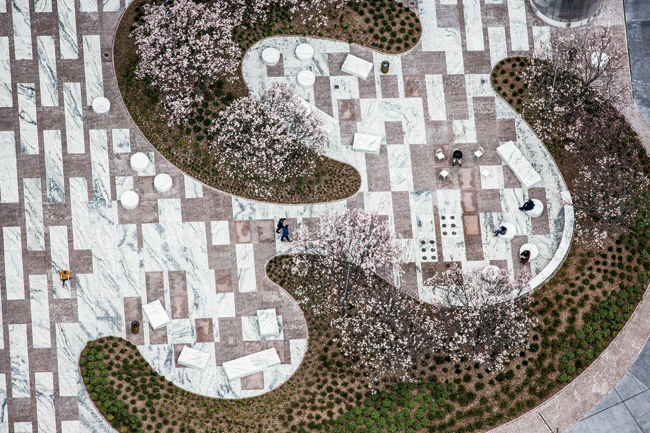 Magnolias add a park-like element to the hard-surface plaza, while a fountain invites interaction. As a commenter recently noted, the Harvard Shuttle doesn't come to Barry's Corner. The stops closest to the Allston neighborhood are at the I-Lab and Harvard Stadium. There is one shuttle every 30 minutes. Between 10am & 4:15pm, sorry but there is no Harvard Shuttle this summer. "Currently, there are four new projects which include approximately 100,000 square feet of retail and service uses being planned, permitted and constructed in and around Barry’s Corner. These major projects will bring visibility, new housing and employment destinations and a surge of retail and pedestrian activity to Barry’s Corner." Can you believe that one of these "major projects" that will contribute to a "surge of retail and pedestrian activity" is the warehouse, mail room, storage facility, and Harvard Police Shooting Range! is currently under construction with completion estimated at September 2013. Only Harvard could describe a place like this as having a "employee and visitor base [that] will contribute to the activation of the Barry’s Corner retail center." Here's another drawing in the 10 year plan that shows only two of the originally planned 4 buildings being built. The two missing buildings eventually get built according to Harvard's plan, but they are "long term". Does anyone have a clue when that will be?